This time I decided that Rostelecom cup is one of my best chances to watch figure skating of such level live. So, I packed my things and traveled to Moscow. Here’s my live impressions. Moscow greeted me with snow, difficulties with wi-fi and obscene graffiti about authorities. For the first I was prepared. Thanks to Valentina Marchei who posted lots of photos with snow in Moscow. The weather forecast is one thing, but a real picture is quite another. I wasn’t ready for the second, I was quite in shock that you can’t just connect to wi-fi in any caffee without any problem. Third – made me smile. Like I never crossed the border. It wasn’t easy to buy good tickets, all, lets say pretty ok, tickets were sold. So I was surprised to see lots of people with free invitations on the best sits. People, who actually don’t care about figure skating and just have nothing to do instead. Some of them were even wondering when Plushecnko will skate. But Russian figure skating leadership can continue to say that it’s impossible to make money on figure skating. Guys, have you at least tried? Evdokimova – Bazin made me nostalgic about Tessa and Scott’s latina, which I saw at the same ice in far 2011. Thank you for tribute but I didn’t understand what it was and why) Belarusians wasn’t so bad as I imagined. Beaudry – Sorensen skated softly, but their skating is not so wide and powerful. The short dance is not very memorable, but I liked the FD – sensitive. From the stands her robe a la Gabriella Papadakis is not so distracting. But the stationary lift looks better on TV. I like how Zahorski and Guerreiro do lifts – it’s their strong side. They try to skate close to each other, but haven’t enough speed and power yet. I liked their free dance, it seems that when Zhoulin don’t have to show his best he came up with good and solid dances. It was interesting to look at the Italians. On TV I started to like them more and more from competition to competition, and live impressions were also very positive. Charming short dance! And music for the fd just beat everyone else’s music) Because it’s almost impossible to compete with Tchaikovsky. And while the Italians skate beautiful and complicated dance to the Russian classics, Russians continue to believe that Chopin + Vivaldi is a cool mix. And if someone tells me again about the exterior and other soooo impooortant things for ice dance – I’ll punch him in the face, no offense. Kaitlyn Weaver – diva! How she is presenting herself! And she starts to do it with the first second of the warm-up. From the first sight at Andrew Poje half of the female majority in the Megasport arena wanted to jump out on the ice immediately. The other half was sitting and thinking – to jump out now now or wait for Javi. Cool short dance. Kaitlyn’s dress I will need to see in close-ups, but I liked it. Twizzles were budget. FD – all the same Weaver-Poje style seasoned with some new things. They didn’t make me scream of delight, but both times their scores caused a feeling that “Canadians were ripped off”. Perhaps the most memorable of the short dance was Chock and Bates’ step sequence. I did not expect, but I really liked it. And a lift – it was cool, effortless and very impressive. The first part of the FD is cool, but then I got lost. Mistake on twizzles … whatever it was – it’s a loss in reputation in the fight with Shibutani for the US title. After standing near Madison Chock, I want to seal my mouth with duct tape and buy a padlock on the fridge – she’s so small and thin! Bobrova – Soloviev have the wider and faster skating and the most impressive pattern. Finally, in both dances Katya look amazing. Little black dresses suit her a lot. But I did not expect that live their free dance will look so ……… funny ( There were moments when I really wanted to giggle, if it were not so sad. And Vivaldi was to fast even for them. I was so angry, because a pair with best qualities, best skills skate this instead of nice and sophisticated dances. Max Aaron didn’t impressed me with his Nessun dorma, but his FP I’d like to re-watch) Almost every his program has a moment that “makes” the whole performance) In Gladiator he was scratching his neck, in the Swan lake – an epic code. And this program has so many of such moments!) Sorry, Max. Another memorable impression from watching figure skating – Mikhail Kolyada‘s jumps. He jumps so effortless! Misha is such a charming guy, he knows how to communicate with the audience, feels free and relaxed on the ice. And such a rarity for Russian male skating skates such tasteless programs wearing not less tasteless costumes( I can deal somehow with his costume for the SP, but the jacket from the FP needs to go back where it belongs – back in the 80-90th. On the background of the rest Shoma Uno looked almost like a god of skating skills. It was very interesting to watch him on the warm-up, he was skating almost like a boss. His short program flew in one second! Half of the free program I was waiting for this woman scream, but still it’s a powerful program. And even his plushy pants don’t look so irritating from the stands. But I still had a feeling that Shoma looks more impressive on the TV. He lacks some power, his movements look small….of course it’s because of a natural reasons…..but you know how they say – the stage loves tall….but multi-rotational jumps do not. 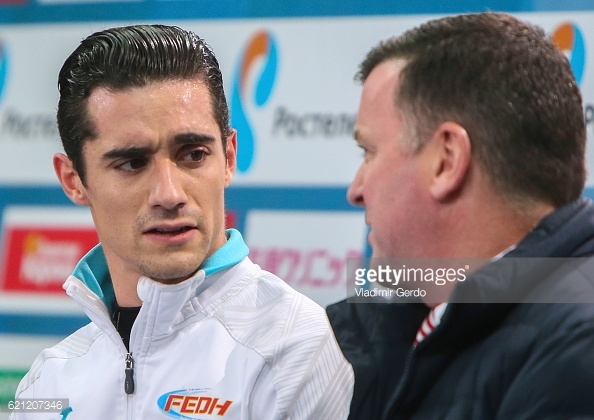 Javier Fernandez goes to Cup of Russia like to his home grand-prix. I think it’s his 6th Cup of Russia) You know, I’m a fan of laconic men’s costumes. But this change doesn’t make this program look better. Skaters wear such costumes when they want to concentrate all the attention on their body lines, choreography….let’s be honest, those are not Javi’s strongest sides. Of course, he’s a charismatic bomb. He’s a terrific contact with the audience, he winks, flirts and all of this look natural. After Javi’s performance second half of the female majority jumped out on the ice, and someone even wanted to do it again. But his step sequence….I’d say he walked it. That is why, if I see in protocoles the same marks for skating skills for Fernandez and Chan I’ll laugh right into the judges faces….because it’s ridiculous. Goda Butkute is a very well dressed girl. Her costume designer did a good job. Seguin – Bilodeau were among those whom I wanted to see live to compare the impressions. From the stands you don’t see her chubby cheeks, instead you can concentrate on nice skating and lines. I think lyrical programs suit them more. That is why the free program despite mistakes left very positive impressions. It’s a pity, that with a victory at Skate America they are out of the Final. Diva! Diva Valentina! Valentina and Ondrej it’s a storm of emotions on the ice. It’s always a pleasure to watch them skating and even mistakes don’t bother me. Still a good progress since their last GP. Kristina Astakhova has a nice lines, she looks way more polished than her partner. I noted that they have not a big distance on the throw, but Kristina has beautiful position on the landing. It was a right decision to go back to new costumes for the FP, but it still looks too theatrical. I don’t think that such programs can look “expensive”….maybe I just don’t like such style. Zabijako – Enbert is an incredibly beautiful pair. With such a long lines ….but such long lines just ask for powerful and wide skating. They don’t have such yet. Everything is good, good quality of the elements but they lacks some chic. They also have some retro look … ..I haven’t decided yet is it bad, or it can possible be their thing. And I’d suggest a costume change for the FP. Because it’s unclear what are they going to skate – Winter by Vivaldi or Gray Swan. No matter how many mistakes Aljona and Bruno do, they had no one to loose to here. A quick look is enough to understand that Aljona is a skater of an extra-class. It was weird to see that during the warm up she didn’t skate with her partner at all. They are warming up separately. I do not know what to say here) Aljona is a desperate woman! She didn’t do a 3axel throw but went on quad at the last seconds of the free program!And Bruno…..Bruno needs to improve and study German. And yes, the prize for the best dress of the competition goes to Aljona Savchenko, her dress for the free program is gorgeous. After withdrawal from Skate America and no inspirational info about her, I didn’t expect anything good from Julia Lipnitskaya. But I hoped. I hoped at least for a solid skating. And the sp only increased such hopes. The free program was heartbreaking. Julia’s character makes her honor, as a person, but not every heroism is good for a person, whose career depends on his health. And then I have a question – why the team did not have a plan what to do in such situation? Haven’t they discussed what to do if some problems arise during the performance? But let’s not make a tragedy out of the situation. Let Julia restored calmly. When you watch Kanako Murakami and Anastasia Galustyan you see beautiful girls in beautiful dresses skating nice programs. And then you look at the monitors of the technical pannel – there all jumps are red…. like Kimmie Meisner said in the recent TSL review: if they wanted to review something then you can start to worry. Nicole Rajicova left very pleasant impression. Feminine skating. Rain in your black eyes sounds good on the ice) I hope someone else will take it, it’s beautiful music. I have a feeling that Yura Matsuda was underscored in PCS. Such a nice girl, with smooth skating, good and not typical programs. Dresses …… well, the first one is retro, the second one just terrible) But she’s a memorable girl. Elizabet Tursynbayeva easily disguised as a flower girl) But, to my surprise, in spite of her tiny parameters she has a good speed and decent ice coverage. She also has nice dresses and nice programs. However, during both her performances I had a desire to save the child from the monsters and immediately feed her. Finally, my favorite beauty Zijun Li had two solid performances. Firstly, she did not disappoint me live. But they need to polish her arms. Secondly, she finally has the fp without fast music in the end, with which she couldn’t cope. Maybe her physical shape improved. And I have a feeling that she was underscored in PCS! I hope she will continue to take some lessons from Mishin, I see some positive changes. The best thing in Courtney Hicks skating is her jumps. So jump baby jump. Well deserved bronze medal! Lena Radionova is growing up and turns into a young woman. So, now there is less rushing in her skating. Cool short program – stylish and bold, not like a typical program of Russian single skater. I liked such Lena. Of course now she has to fight for her jumps. The free program is not at the same level with her short. This music also requires more powerful skating, which Elena lacks. But after her titanic almost anything will look almost a masterpiece. It was a great experience, I was bringing back a lot of impressions and a wish to come at Rostelecom cup next year. Madison Chock is fabulous, end of story. Like seriously, I don’t think anybody noticed that Evan tripped up on the twizzle. Nobody was even looking at Evan. Ekaterina and Dmitri…they were very good, but I don’t know…I’m not an expert on ice dance, but I feel like they were a little over-scored. Sorry, but I don’t quite get Max Aaron’s programs. “Nessun dorma” does not fit him. As far as the Lion King free skate, I’m not really a fan. Mikhail is a great skater in awful packaging. His choreographer is killing him. He could be a soft, lyrical skater, his edges are nice enough, so WHY THE HECK are they putting him in bad costumes and bad choreo? I’d like to see him skate a simple, beautiful program. I saw Shoma in person at Skate America 2015, and he is so beautiful to watch! Of course he can’t skate super powerful because he is a smallish guy, but he makes the most of it. Javier is darn handsome, but his footwork isn’t his strong point. And I miss his old costume! The red was so striking! I’m not a huge fan of his free program. The only Elvis Presley song I like is “Can’t Help Falling in Love”, to be honest. My friend and I see Julianne and Charlie as a future Meagan and Eric. They are so young, they have plenty of time to get consistent. They still have an outside chance at the Grand Prix Final. I wouldn’t count them out. I am such a fan of Kristina Astakhova. I hope she ditches Alexei for a young partner who can keep up with her. Aljona is flawless, but you’re right, she is desperate. That quad is plain insanity, she’s bound to miss it every time. Even the best pair girls struggle with quads AT THE BEGINNING of the program. This is downright stupid. Elizabet Tursynbaeva is a great little skater, but she is so tiny that sometimes it’s hard to watch her as a real contender. You’re thinking “Oh, what an adorable little girl!” instead of “This young lady is super talented.” She is one of those skaters who you actually HOPE will fill out in puberty – she is so slender. Zijun Li was severely underscored. She’s a beautiful skater, I like her a lot. I haven’t seen anything like it lately, but it’s lovely. I’m happy for Courtney Hicks. The idea for a Maleficent program had been rolling around in my head for a while and I wondered who would skate to it. I like how Elena is maturing – though she still looks rather young, it’s a lovely package. I was nervous about how she’d handle “Turandot”, but it’s not bad. I like that they used a lady’s voice instead of a man’s for the vocal part, it fits her much better. The last thing she’d need would be Pavarotti roaring over her delicate skating. Anna is a lovely skater. Since she’s gotten better AFTER puberty, I think she’ll start taking over as the mature lady skater competing against the little girls. She has some real Ashley Wagner potential, and I’m very happy to see that she isn’t falling all over the ice anymore! This has been a fun competition. Onward and upward! Wow! What a great huge comment! Thanks! Loved it! And agree with almost everything! Zijun Li is an incredible beauty! Looking at Elizabet Tursynbaeva your first thought ‘Why flower girl don’t leave the ice’. But she’s a lovely skater, with good ice coverage and solid programs. Your heart belongs to Patrick Chan, right? I think Elizabet could take the same approach as Satoko Miyahara for being tiny. Satoko is little but she’s dynamite! Max Aaron is WAY too much into that “being a lion” thing! I was surprised that Zijun Li in live looks as beautiful as on TV. Both as person and skater. She has very beautiful face and perfect skin tone, she isn’t so small as I expected, and has slim but feminine body. Plus she’s one of the best dressed ladies in figure skating. Zijun is gorgeous. She’s like a perfect doll in a store window. And she skates so stunningly! Yeah, I guessed you had a tiny crush on Patrick :) I have skater crushes too, so I understand. I should also thank the organizators of GP in China, I won’t have to wake up too early to watch men’s event) But honestly, I start to think maybe it’s better not to watch live) Mao took all my nerves and tears…. I am always so nervous watching skating! I was nearly unconscious by the end of the pairs’ free skate at Worlds. Between cheering for Duhamel/Radford and crying for Stolbova/Klimov, I was a mess. Carolina is coming back this season, interesting choice. You are so lucky, not having panic attacks through pairs! Those throws scare me to death! Literally on the day of Worlds, I was pacing the house waiting for the event to start. I couldn’t take it! By the way, are they planning to compete at some b event or local competition before US Nationals? An insightful and entertaining review. What did you think of the brown costumes of the ladies skaters? I like brown but most people don’t. Did you give Evan Bates a kick in the leg to make him stumble in the twizzles? I don’t know why so many people don’t like brown on the ice…..the same weird situation with green. I like Julia’s brown dress for the SP a lot! It’s gorgeous and suits her a lot. I have no clue what happened for Evan on the twizzle. Maybe he just lost focus, I don’t know. As far as brown, I like it when it’s tasteful.